Thanks and a Happy New Year!!!!! I can't believe that today is the last day of 2008. WOWW, this year is gone!!! First I want to say Thank you very much for letting me be here, yes because of you my friends I am here. When I started this blog I think I was the only one reading it, now I believe there is more people doing it, LOL. Never in my mind I thought I would be in a Design Team, Thanks so much to Tamara and Susan for inviting me and letting me be part of their companies!!! You are such great people, I am so blessed to design for you ladies. This year I met a lot more people online (great people) I don't want to mention names because the list is LONG, great people that listen to me when I was sad, feeling under the weather, people who always lifted my spirit, Thanks!! During this year also I received e-mails from ladies I never heard here or anywhere, saying Thank you for the music or for whatever I wrote on my blog, that was always a surprise for me because I am not the perfect English writer, I have a lot of typos, Thank you again for your wonderful words!!!! I hope and pray 2009 is a great year for you and for me. Believe in yourself and never say NO, I can not do it, because you CAN DO IT!! 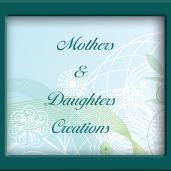 Now, I want to show a couple of Thank you cards I create for Mothers & Daughters Creations Blog Challenge. Card Stock: Real Red, Confetti White. Accessories: Sewing machine, Red thread, sponges, 3D foam, SU Dimensionals. Card stock: Bravo Burgundy. So Saffron, Handsome Hunter. Embellishments: Martha Stewart Ribbon, Offray White Satin Ribbon. Accessories: Uniball White Pen, 3D foam, Mini glue dots. Hello everyone, I hope you are having a great day!!! First I want to say Happy Birthday Daddy!!!!! I called him this afternoon, we talked for a while and Rebecca too, well, she talked only for few minutes because she speaks English and he Spanish, BUT she can say CHOCOLATE perfectly in Spanish and she was extremely happy because grandpa sent a box with different kind os chocolates for us!!! Oh I was in heaven yesterday when I tried one, so delicious, yummy!!! Anyway, the other day reading Ellie's blog I read about Garret, a 7 year old boy with Acute Lymphoblastic Leukemia. He was not feeling really good and Ellie was asking if we could send him a card to bright his days and of course I say YES!!! I made this cute card for him, I hope he likes it. I used one of the new releases from smARTworks LOL . Card stock: Bashful Blue, Barely Banana, Pacific Point, White, Green. Accessories: Mini glue dots, 3D foam, Sponges. Happy Sunday everyone, I hope you are having a great day. I am having a great time with my family and also I managed some time to create a card. 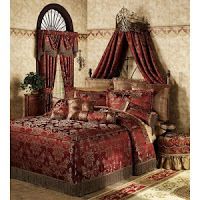 As I told you yesterday my mojo is taking a break, I don't think it is back yet, so today I found some inspiration from a Bedroom set I found on Costco Magazine, I believe this one is from October because I was trying to find the same set on their website and it is not there. Anyway, I hope you like my card, it is very simple and if you like quilts probably you will like this one. 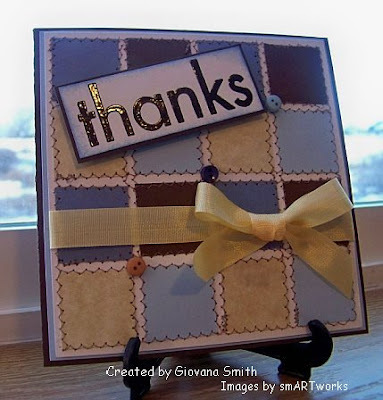 Card Stock: White, Chocolate chip, Bashful Blue, Brocade Blue and Tan Parchment. Ink: Chocolate Chip Craft, Bashful Blue. Embellishments: MS Ribbon (Yellow Dahlia), Mini buttons. Accessories: Sewing machine, embossing powder, embossing gun, Mini glue dots, 3D foam by EK Success. Hello!! I hope you all had a great Christmas. We did have a great time together. On Christmas Eve we went to church and sang some Christmas Carols, we enjoyed the little kids choir, it was a really fun time looking at them singing, of course some of them they were looking for their parents or just looking around. On Christmas Day, Rebecca got up at 7:15 as I told her night before, she told me that she wanted to open present after breakfast so that's what we did. I have been spending time with my family and playing UNO with Becca, I think from all the presents she got the UNO game is her favorite, LOL. We have played outside too, this was not too much fun for me because here has been REALLY COLD!!! 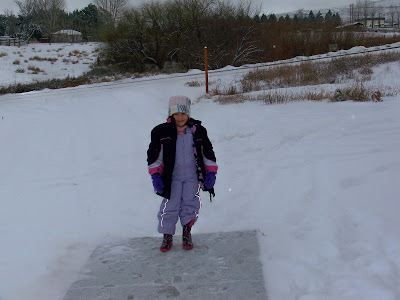 but kids don't care about that, when she was playing in the snow I was shoveling snow, LOL. Anyway, my MOJO has been taking a break too, I hope is back tomorrow so I can post something here. I hardly post pictures of me, maybe because I am not photogenic and I prefer to post my cards, LOL. 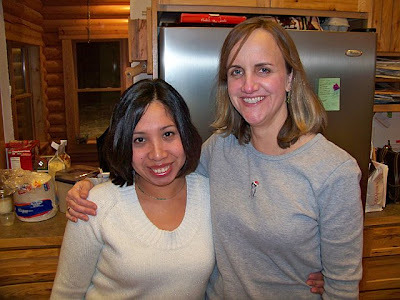 My family was invited to the Christmas party in Cle ELum, we lived there before we moved to Yakima, we were so glad to see our old friends, Thanks Amy for the invitation!!! I am not posting my Christmas pictures because we all were wearing PJ, LOL. Thanks so much for stopping by and stay tune because my Blogaversary is coming. It has been a while since a post some blog candies found in my travels into blogland. Today I found this super Blog Candy at Life as Lou, she is giving away Cosmo Crickets products worth $150.00!!!!! isn't this amazing!!! Hello everyone, I hope all of you have a great day. Tonight, we will go to our Christmas Service, sing some Christmas Caroles, have fun and celebrate the real reason of Christmas: Our Lord and Saviour Jesus!!! Today on MDC is a challenge day (actually we do it on Thursday, but we want you to focus on your family!!!) and our challenge was to create a HANDMADE CHRISTMAS ORNAMENT. I created something not new in any way, but a little bit different "A Christmas Tree Ornament"
4 pieces of different Patterned Paper: Christmas Magic Gloss Embossed - Vines, Christmas Magic - Snowfall/Holiday Dots both from My Little Yellow Bicycle, Gilbert by Melissa Frances and Windsor-Lancaster-Flocked by SEI . Straight and decorative edge scissor. 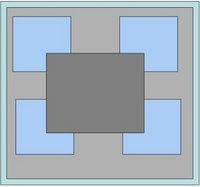 Cut a slit to the center of each circle with straight scissors. 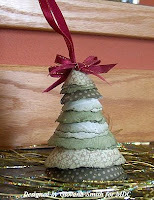 Cut around each circle with your decorative edges scissor, then sponges each circle. 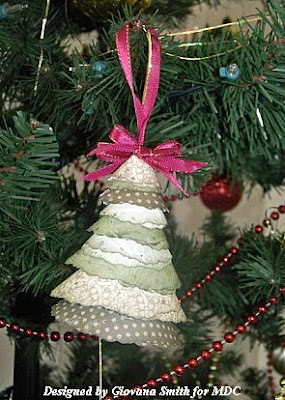 Add the ribbon in top so can be easy to hang on your tree. Add bows if desire. Add some little dots of gold stickles. I hope this info can help, I am not good making tutorials, but I thought this can be a project great for your next Christmas. Hi, I am back with the card I made for baby Francesca. Scroll down a little bit and you will find info about her. This card is 5" x 5.5". 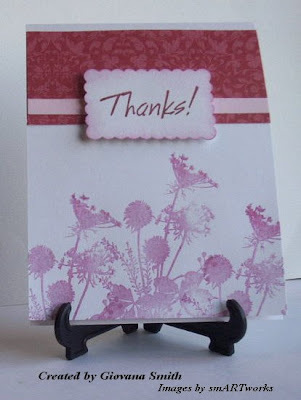 Card stock: Purely Pomegranate, Pink Pirouette, Blush Blossom, White. 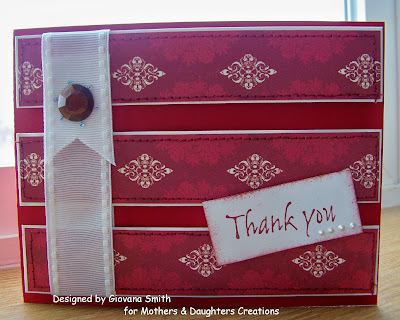 Stamps: Tulip Square and Marble by smARTworks. Ink: Purely Pomegranate, Pretty in Pink. Embellishments: Offray White Satin Ribbon and dark pink Satin ribbon, Clear rhinestones. Accessories: Mini glue dots, sewing machine, brown thread, 3D foam.I hope you like it. Hello everyone, I hope you are having a great day. Yesterday I spent good time of the morning playing in the snow with my daughter, we had a lot of fun, after that we baked some yummy banana bread (I love to add chocolate chip!!!) and just watched TV. During her nap time I made a couple of card that I want to show with you today. 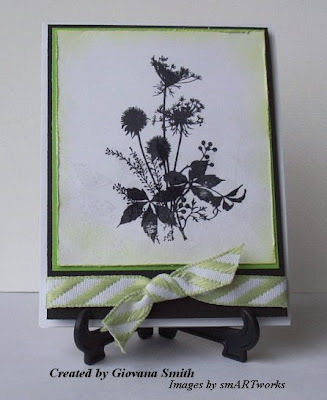 First card is a Sketch from Heather Scott at Oz-Stamps Blog. This sketch is super cool, she calls it very simple, I love it!!! Yesterday I received a blog candy I won few weeks ago, I love everything I received, I forgot about it, (can you believe that??? ), anyway, I received 2 set of Clear Stamps from BasicGrey. I love this set one very much, so I decided to ink it !! Card stock: Barely Banana, Tangerine Tango, White. Ink: Orange (pigment), True Thyme (retired). Embellishments: Dew drops, Gold glitter. Accessories: Embossing gun, Clear ep, 3D foam, Mini glue dots, Sewing machine. 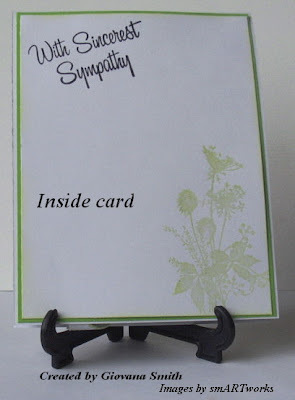 My second is a cute and easy card to make. This card talks for itself, any questions please don't hesitate to ask. 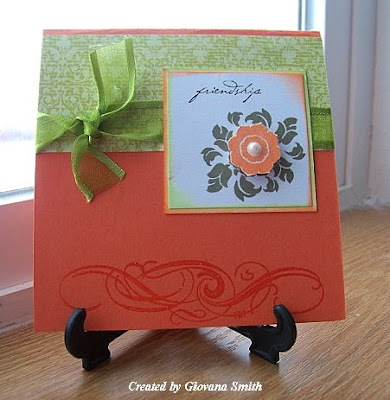 Card stock: Tangerine Tango, Barely Banana, White. Ink: Orange (Pigment), True Thyme, Stazon Black. 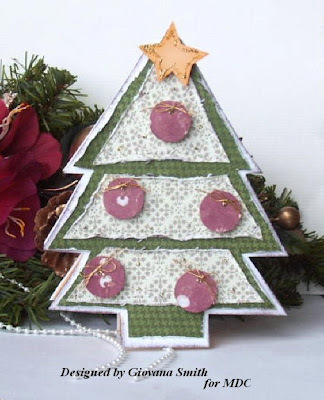 Embellishments: Green ribbon, Kaiser Craft Pearls. Accessories: Embossing gun, Clear embossing powder, 3D foam, sponges. I have to go and bake more banana bread to share with friends, I will back later to share with you another card I made today. Have a great and blessed day!!! Good night everyone, I was just checking my e-mails and a couple of blogs before to turn off the computer and I found this post on Lauren'blog that makes my heart cry. I was thinking to go to bed early, but instead I will spend some time creating so I can send a couple of cards tomorrow morning. These people really need you, a card will make them bright their days. Many of you may remember my dear friend, Chris Garman, who lost her battle with breast cancer 2 years ago. When she was first diagnosed with breast cancer, she was pregnant with her third child. Her doctors didn’t think Chris would live through her pregnancy without treatment, so they took a chance & gave her chemo while she was pregnant. Chris survived her pregnancy & had a beautiful, healthy little girl named Hannah Faith. Chris died when Hannah was three. Hannah is now five, and this breaks my heart all over again, but In October, Hannah has been diagnosed with glioblastoma multiforme, a rare and incurable brain tumor. She was given about 12 weeks to live. She was going to be the flower girl in a wedding in May, but was diagnosed A week after she was asked. Right now she has lost most of her motor skills. She is confined to bed and cannot really do anything or play with the gifts she is getting from people, but she LOVES getting cards - she has gotten so many from people she does not know and just loves to have grandma read about the people who send them and see their pictures and is so proud of all her cards. Her room is just filled with cards. When asked what she wants for Christmas she said she wants to see how many Christmas cards she can get. Many people have passed this wish along to their churches, prayer groups, friends and family. There are school groups where children are making her cards. People are including pictures so she can see who it is that is sending her the card. Baby Francesca was born 2 weeks before her due date and had some complications during her delicery. She is in the NICU and was connected to a ECMO Machine, you can red more about baby Francesca here . Please pray for Francesca and her parents and whole family. Happy Thursday everyone!!! Today is a day challenge at MDC Blog. Today our challenge is an Inspiration one!!! Tamara chose a really pretty bedroom for us to be inspired. I created 2 cards for today's challenge. 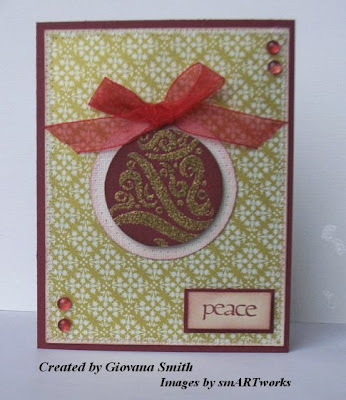 Card #1: Peace, Love & Love to You. 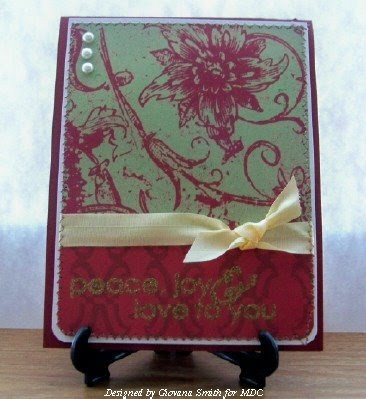 For this card I used Red Floral and Christmas Magic Foiled Paper both by My Little Yellow Bicycle, three Pearls by kaiser Craft. The sentiment was stamped in Chocolate Chip Craft Ink and embossed with Gold e.p. The sentiment is called Peace by Daisy Bucket. 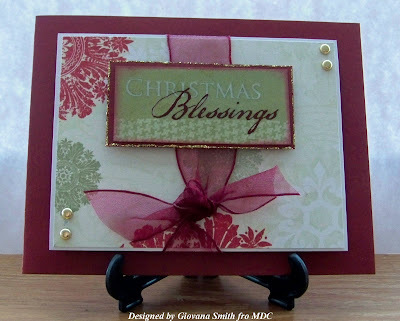 I used some corner punch at the botom of my card and zig zag the Dp with white CS. The picture is not the best, but this card is really pretty IRL!!! Paper: Red Floral & Christmas Magic Foiled Paper by My Little Yellow Bicycle. Stamp: Peace by Daisy Bucket. Embellishments: Pearls, Martha Stewart Ribbon. Accessories: Sewing machine, Brown thread, gold ep. embossing machine. 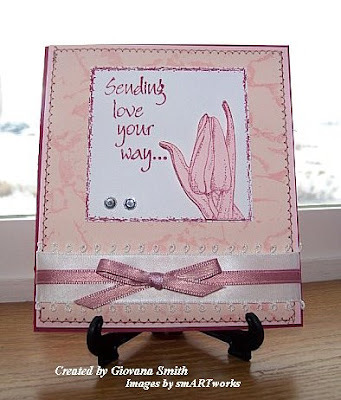 This is card is super easy and quick to make. I didn't use any stamps, the sentiment is a Christmas Magic Rub-Ons by My Little Yellow Bicycle. 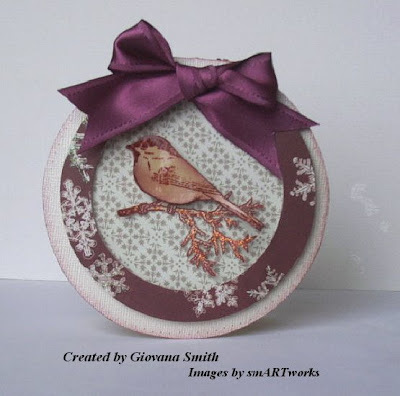 The paper is Christmas Magic-Snowfall by My Little Yellow Bicycle I added some of the new 7/8" Sheer Wired Burgundy Ribbon by May Arts and a couple of gold brads and that's it!!! Paper: Christmas Magic-Snowfall by My Little Yellow Bicycle. Embellishments: Sheer Wired Burgundy Ribbon by May Arts, Gold brads. Accessories: Christmas Magic Rub-Ons by My Little Yellow Bicycle, 3D foam by EK Success. Have a great and blesed day. Hello my friends, I hope you are having a nice and warm day. 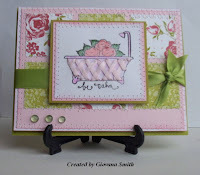 Today I want to show you a card I made few days ago for last week Mother's & Daughters Creations Blog Challenge, It was a Sketch provided by Maria Levine. I know I am a little behind, sorry, better later that never, right? 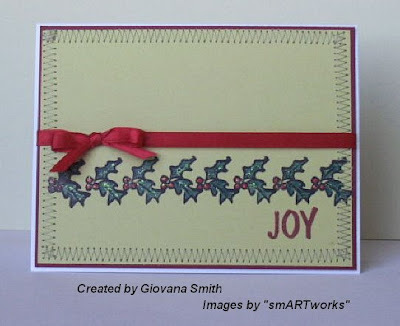 For my card I used this beautiful paper Christmas Magic Foiled Paper - Decorative Band by My Little Yellow Bicycle . I cut the gold band and I used for the squares background. 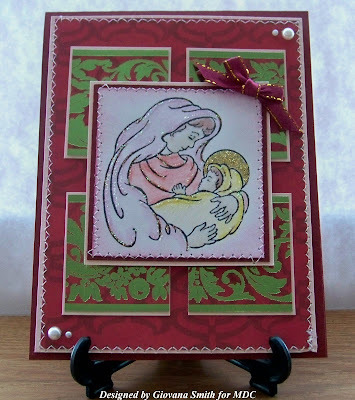 I watercolored the image: Gift of Christmas by Serendipity, then I applied some Gold and Diamond Stickles. I added some Pearls by Kaiser Craft on the corners. I zig zag the panels and I added the cute ribbon on the corner. My daughter got a bag from cookies and the bow was made with this ribbon, I couldn't resist and I saved it for my cards!!! 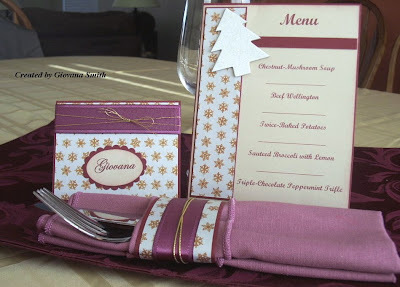 Card stock: Burgundy, Blush BLossom, White. Paper: Christmas Magic Foiled by My Little Yellow Bicycle. 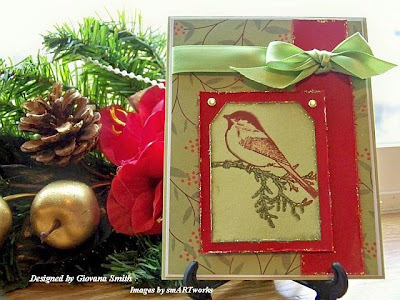 Stamps: Gift of Christmas by Serendipity. Embellishments: Pearls, Burgundy-Gold ribbon, Gold and Diamond Stickles. Accessories: Sewing machine. White thread, 3D foam by EK Success, Mini glue dots, Watercolor pencils, Fantastix Color Blender. Hello everyone, I hope you are doing fine, here I am freezing, the temperatures are horrible!! We had gotten really really low ones like -2F!!!! Anyway, I stay nice and warm inside, so what a better time to stamp!! Today is smARTworks Tea Party Challenge :OVAL!!! I used this new release set called Dbl. Dogwood, I stamped the image twice, colored them with watercolored pencils, recently I purchased the Fantastix Brush-Tip Blenders, let me tell you, they are great!!! I prefer them that brushes. I cut out the second image and positioned over the main one with 3D foam. The BG is dry embossed. Added some Red Satin Ribbon and a couple of gold brads. 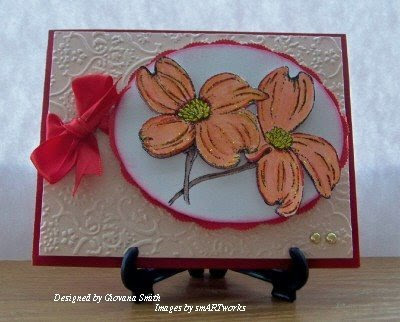 Card stock: Real Red, Blush Blossom, White. Embellisments: red Satin Ribbon by Offray, Gold brads, Gold stickles. Accessories: Cuttlebug, Embossing folder, 3D foam by EK Success, Mini glue dots, Watercolored pencils, Markers, Fantastix Brush Tip Blenders. Have a great and bless day!! A quick post to show you a card I made some days ago and until now I can post. 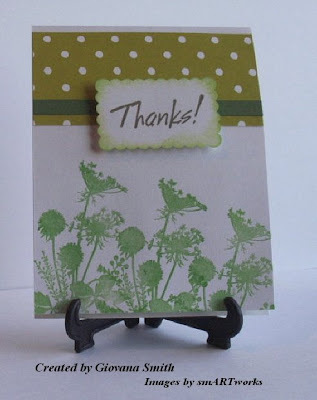 For this pretty card I used a new release set from smARTworks called Buttoned up designed by Dina Kowal, isn't she amazing?? This set has a lot more images, just take a look, you are going to love it!!! Card stock: Tango Tangerine, White, Certainly Celery. Accessories: Sewing machine, brown thread, mini scallop scissors, 3D foam by Ek Success. Thanks for stopping by. Don't forget tomorrow is Tea Party Challenge, just think OVAL!!!! 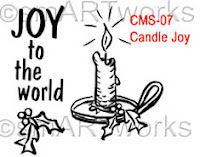 smARTworks DT Cookie Challenge: Candle Joy and the chance to win!!! Hi everyone, today at smARTworks is Cookie Challenge Day. 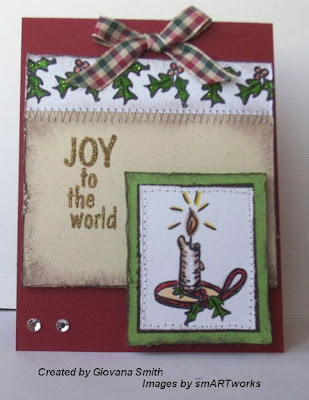 This is my first Cookie Challenge and I am so happy to show you all the projects I made with this cute little "Candle Joy Set" . Susan sent the same set to all the DT members, I can't wait to see what the rest of the team have designed. 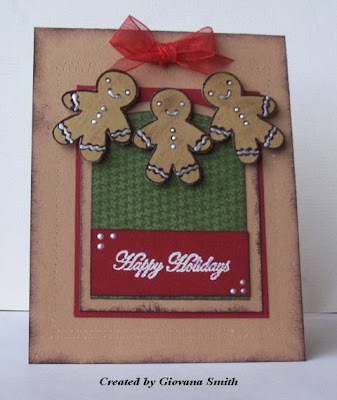 You can click HERE to see all the cards as a group!! Card stock: White, Burgundy, River Rock. Embellishments: Red Satin Ribbon, Gold Stickles, Green Stickles. Accessories: Sewing machine, Light brown thread, Mini glue dots. Card Stock: Garden Green, Real Red, Very Vanilla. 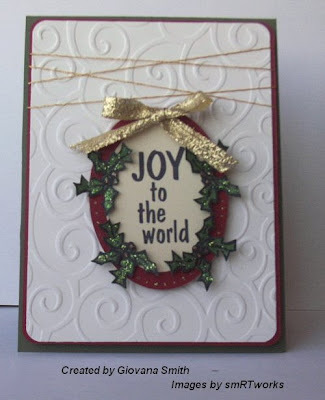 Embellishments: Gold thread, Gold ribbon, Green and red glitter. 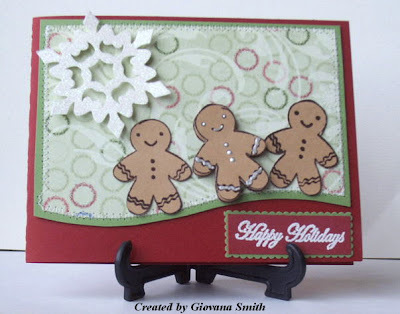 Accessories: Mini glue dots, 3D foam by EK-Success, Coluzzle (Oval ), Corner Rounder Punch. Card stock: Read Red, White, Kraft, Green, Chocolate Chip. Ink: Stazon Black, Chocolate Chip. 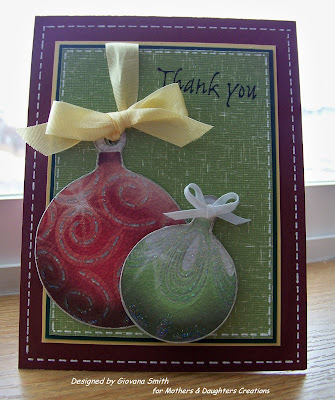 Embellishments: Ribbon from JoAnn's, Clear Rhinestones, Green and red glitter. Accessories: Watercolor pencils, Markers, Clear embossing powder, VersaMarker, Embossing gun, sponges, Sewing machine, White thread, Mini glue dots, 3D foam by EK-Success. Project #4: I downloaded Lauren's My Timeless Template (this is a free one). The leaves are heat embossed. I cut the Burgundy circle with my Coluzzle and then I used scallop scissors around. I added little dots of gold glitter around the white CS. I used my sewing machine for the decoration on top. 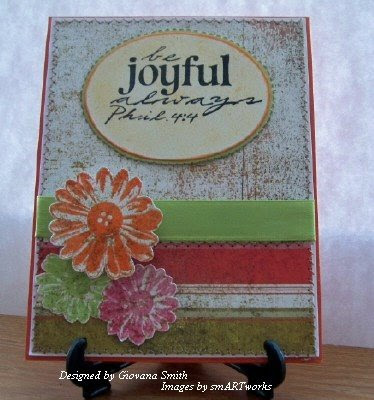 This CS is so pretty, It is handmade ( I didn't make it, LOL) DH saw these colors while back when I started stamping and he bought for me, super sweet! Card stock: White, Burgundy, Green and Red Handmade CS. Ink: Cranberry Crisp, Embossing clear pad. 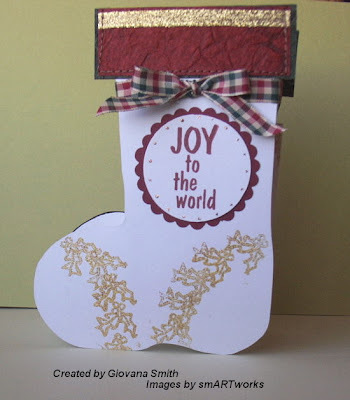 Embellishments: Ribbon from JoAnn's, Gold stickles. Now, would you like to win these cute set??? Well, head over to Susan's blog and answer the question posted there, that's it!!! Labels: Cookie Challenge, smARTworks stamps. Hello everyone, just in case you are wondering where I have been, well, let me tell you these last days have been crazy and busy and I am still alive. We have been praying for snow and we finally got it, yesterday we had snow for hours, my DD was so excited and happy!!! To be honest I was very happy too, my yard doesn't look too bad when everything is just white, LOL. The temperature dropped so fast that it wasn't funny anymore. This morning when we were ready to go to church it was only 18F, I was horrify. I have learned how to deal with the cold weather (because in Lima, Peru we don't have this temperatures), but today was the worst day I think. In addition of that, the wind was so strong that made it worst. After church we went to Costco and then to Walmart, after that I got a horrible headache, I came home and took a nap, didn't help much. Tonight we expect -2F, so I am not planning to go anywhere, too cold!!! I hope tomorrow I can finish the projects I started few days ago. Hi everyone, I want to show you some card I made when I was at my in-laws' house. 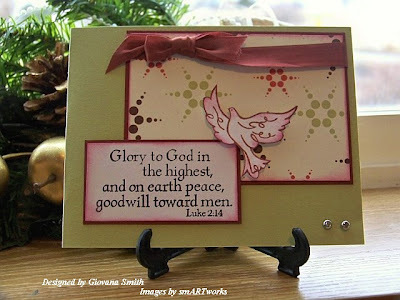 I used 2 smARTworks set:Lk 2:14 and Chickadee Wishes . Card stock: River Rock, Burgundy, White. 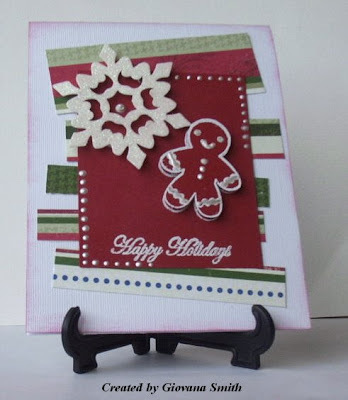 PapCard Recipe:er: DP Winter Soulstice by Rubber Soul. 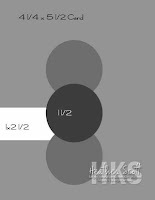 Stamps: Lk 2:14 by smARTworks. Embellishments: MS Ribbon, Silver brads. Accessories: Sponges, 3D foam by EK Success, Mini glue dots. Card stock: River Rock, White, Real Red. (Card1), Real Red, Kraft, River Rock (Card 2). Paper: DP Winter Soulstice by Rubber Soul. 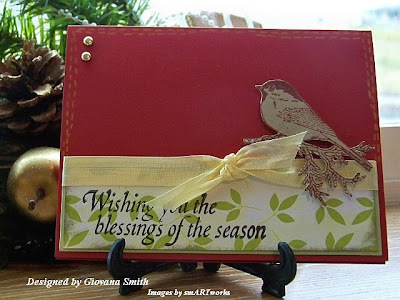 Stamps: Chickadee Blessings by smARTworks. Ink: Cranberry Crisp, True Thyme, Stazon Black. Embellishments: Gold brads, Green Satin Ribbon, MS Ribbon, Gold Stickles. Accessories: Mini glue dots, 3D foam by EK Success, Sponges. Do you like how my pictures look like now?? I got a new camera!!! This is a Kodak Z1012 IS, It is great!!! I am learning how to use it, but so far I can take pictures at any time and I love all the features so far, LOL. Hello everyone, I am back !! We came back home yesterday afternoon, all very tired. Last week was a very busy week for us, we spent 6 days at my MIL's house. We helped her as much as we could. Rebecca had a lot of fun playing with her cousins (17 and 13, LOL) and also chasing the cat and taking the dog for a walk. The weather wasn't too bad, but I didn't bring a heavy coat, so I spent most of the time inside than out. Last Sunday was my FIL's Memorial Service, it was a time to remember him, time to cry and time to smile. We were happy to see all his brothers, friends and a lot of people that I didn't know. Rebecca (who is only 4) woke up last night crying because she couldn't sleep, she told me this morning she was crying because she misses grandpa. Thanks so much for all your prayers and support. On other news, Susan (owner of smARTworks) asked me few days ago to be part of the DT, I accepted of course. Thanks so much Susan for the opportunity. I changed my Blog a little bit, colors and picture. I took that picture yesterday on our way back home. This is White Pass (WA), we haven't had snow yet, we hope soon, DD really wants to make a snowman and angel wings. I added some Christmas songs on my playlist. I will try to come back later to show you some cards I made few days ago. Hello everyone, I hope you are having a great day. 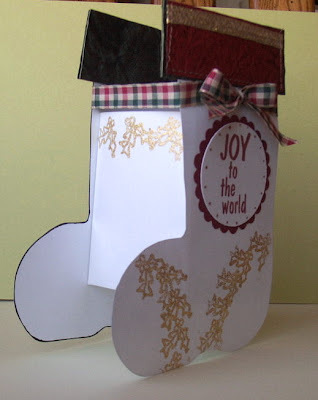 Today is a Thursday Challenge over MDC Blog Challenge and today's challenge is to create a Holiday Shape card. I created a Christmas Tree card. I hand drew the tree and then transferred the designed onto my card stock. For my card I used 3 different Designed Paper: The main DP is Christmas Magic - Ribbon Stripe/Dk Green Herringbone, the stripes are from Alpine Frost - Dust of Snow - Glittered and the little red ornaments are from Frosty DP. For the star I used a little piece of Barely banana CS, I sponged the borders and added some Gold Glitter. The base for my card is Bazzill White CS, I sponged the borders of it with Chocolate Chip Ink. I hope you like it and could play the challenge too. 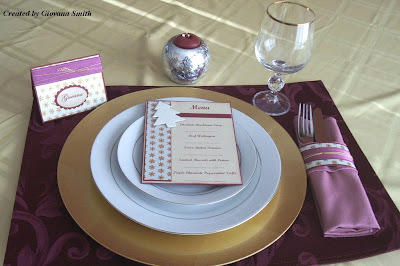 Hello, today is smARTworks Tea Party Time and this time Dina is hosting this challenge. Our Challenge today is to create and Christmas ornament. My ornament is really cute, LOL. I hand drew the image on a piece of scrap paper and then transferred it onto CS. 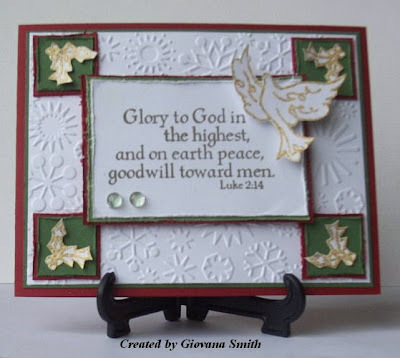 For my ornament I used the Dove from Lk 2:14 Set and the sentiments are from ABC-Peace Tree . Paper: SU Cerise (retired), SU Bella Rose. Stamps: Lk. 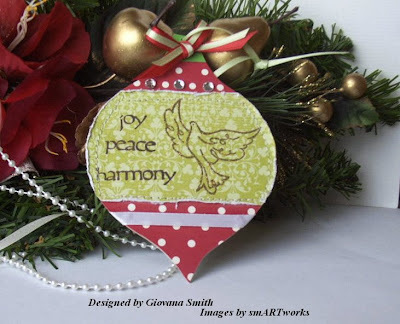 2:14 and ABC-Peace Tree by smARTworks. Embellishments: Offray Satin Ribbon (White, Red and Light green). Accessories: Mini glue dots, Clear rhinestones, Sewing machine, White thread, Gold ep. Embossing gun. Head over to Susan, Dina, Trish, and Donelda and enjoy their creations too!!! I hope you like my ornament. Hi everyone, I hope you are doing fine. I am back (well, kind of) and I will be posting (already set up) projects for the next few days. Tomorrow is MFT release and of course challenges and contest. I am hosting one Ambassador Challenge and I am so happy!!! 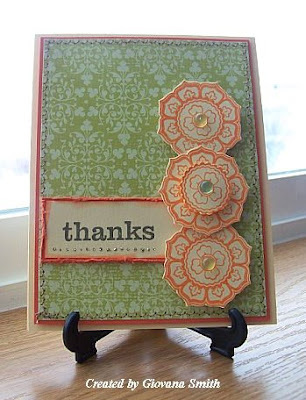 (big smile included) My challenge for you is to create a card, project using buttons (at least 3) and some kind of blue, that's it, easy peasy. 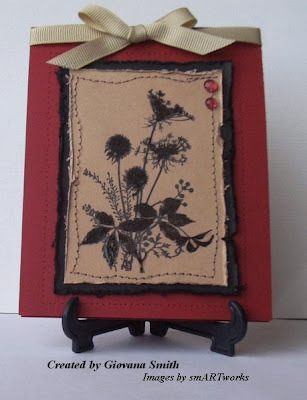 For my cards I used A Scarf for three by Stephanie Fizer. The pretty paper in my blue card is Winter Soulstice Collection by Rubber Soul Paper and the pretty ribbon is Shimmering Grosgrain Blue/Red by Chillin' Ribbon Collection all these products from MFT. For my blue card I used my sewing machine (zig zag stitches). I heat embossed the image in Silver ep, then I colored the image using Waterfall stickles. I used 3D foam to give it a little bit of dimension. I added some gray thread on the buttons. 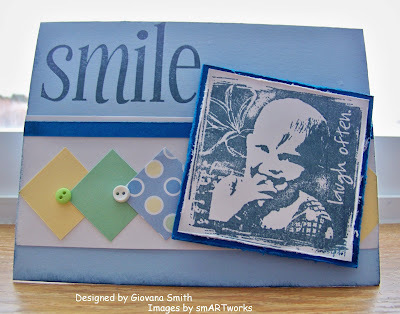 The sentiment was stamped using Buckaroo Blue ink. 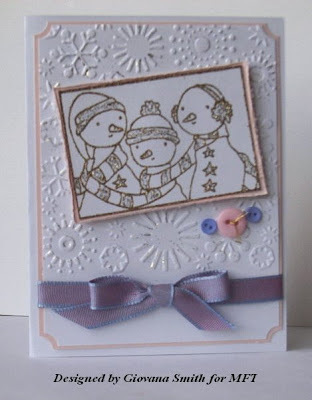 For my Light Pink card I heat embossed the image using Gold ep, then I colored the image with Gold Stickles. I embossed the White CS using my Cuttlebug. Buttons and ribbon were added with mini glue dots. 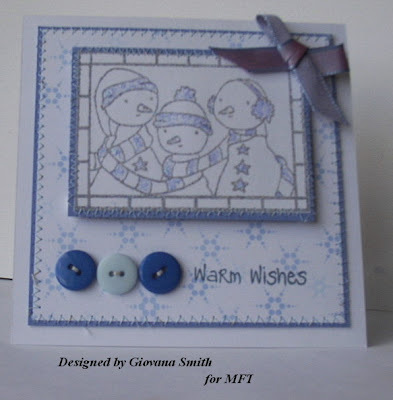 Stamps: MFT A Scarf for Three. Paper: Winter Soulstice Collection by Rubber Soul Paper. Accessories: Sewing machine, Light blue thread, 3D foam by EK Success, Cuttlebug, Embossing folder, Mini glue dots. I hope you like them and play the challenge too. Personal Note: I am heading to the West side tonight to attend my FIL's Memorial Service. Thanks so much for your prayers and support to my family.